But service providers say the plan would be a big improvement over the city's leased shelter on Oxford Street. 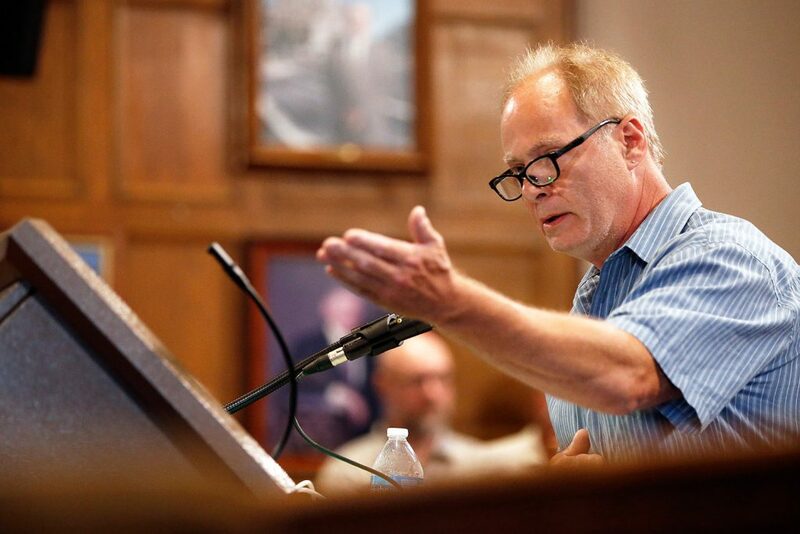 MIchael Archer speaks at Tuesday’s hearing before the Portland City Council’s Health and Human Services Committee, saying he will be concerned about his 6-year-old grandson’s safety if the city moves its shelter to Brighton Avenue. Archer was one of many residents to speak out against the plan. 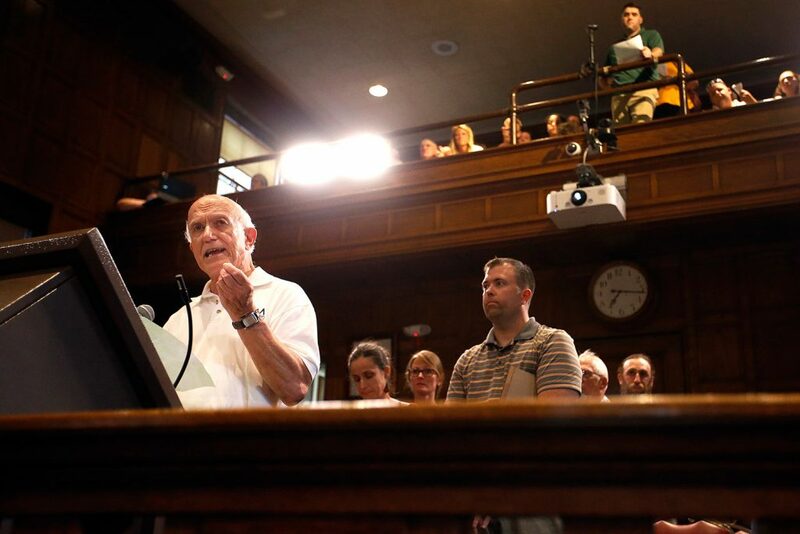 An overflow crowd turned out Tuesday at City Hall to weigh in on a proposal to build a new emergency shelter on Brighton Avenue in Portland. Although several service providers voiced support for the proposal, about four dozen residents of the Nason’s Corner neighborhood pleaded with the City Council to slow down its deliberations, to be more transparent with its rationale and to consider building smaller shelters throughout the city, rather than one large one in their neighborhood. Concerns ranged from public safety, especially for children attending a nearby elementary school, to lower property values, to the lack of neighborhood discussion and outreach before the city’s announcement. They were concerned that officials have not done an impact study on the proposed location and struggled to answer questions about costs, layout and size of the facility. Some people, including City Councilor Brian Batson, who represents District 3 where the shelter would be built, questioned the ability of nonprofits and other agencies to provide services at the new shelter, which would be near the city’s border with Westbrook. Representatives of Opportunity Alliance Greater Portland Health, the Shalom House, Amistad and Milestone Foundation all voiced support for the proposal. It was the first official public hearing before the council’s Health and Human Services Committee on the proposal to build a 200-bed shelter on the campus of the Barron Center, a city-run nursing home at Brighton and Holm avenues. The committee did not take any action and will continue to study the recommendation. A vote could come in September. 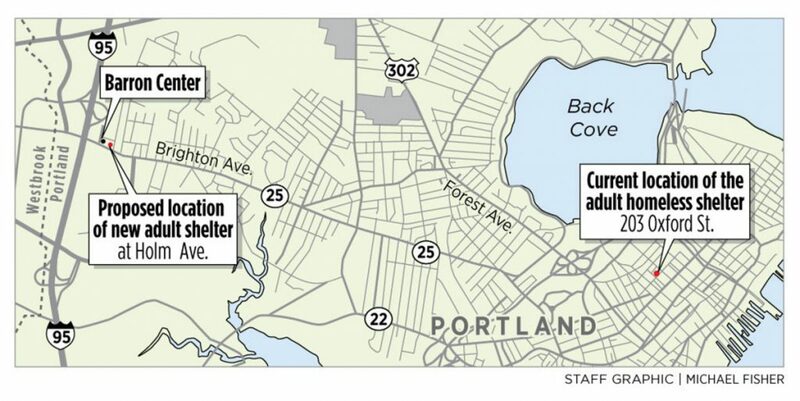 Richard Niles was one of many residents of Portland’s Nason’s Corner neighborhood who expressed opposition at Tuesday’s hearing to a proposal for Portland to open a center for the homeless at the site of the Barron Center on outer Brighton Avenue. The nearly three-hour hearing followed a neighborhood meeting last week where more than 250 residents railed against the proposal, with many people shouting and booing city officials as they tried to explain their rationale for recommending that the new shelter be built at the Barron Center site. Tempers seemed to have cooled by Tuesday, although it was steaming hot in council chambers. Resident after resident called upon the city to produce an analysis of all of the locations it has considered and why one large shelter would be better than several smaller ones. The city is looking to replace the Oxford Street Shelter, which can accommodate 154 adults sleeping on thin mats placed on the floor only inches apart, with a $10 million facility that would be safer and more efficient for clients and staff. The current shelter is a three-story apartment building at 203 Oxford St. that the city does not own. And it does not have a kitchen. The new shelter would have a soup kitchen and pantry, as well as laundry, housing, employment and health care services located on site. It would also have a community policing office. At the beginning of the meeting, Oxford Street Shelter Director Rob Parritt spent about an hour answering the council’s questions from previous meetings. The Oxford Street Shelter served 1,456 individual men and 464 individual women in 2017, he said, noting that 77 percent stayed for 60 days or fewer. But Parritt stressed that the city was looking at a new model – one where people would not have to line up outside to wait to sign in or walk two blocks three times a day to get a meal or receive day services. A combination of public buses, city vehicles, a shuttle service and transportation vouchers will help people access services not offered on site, he said. “We are in no way, shape or form going to replicate what we have at Oxford Street and put it into the neighborhood, because that’s not going to work for anybody,” he said. But longtime residents were concerned that is exactly what would happen. They worried that area green spaces and woods, including the Evergreen Cemetery, would become homeless encampments populated by people who may get kicked out of the city shelter. “These are at best drug dealers and at worse human traffickers and rapists who are going to be lurking in the woods because they’re not going to be allowed into the Barron Center,” said parent Justin Riley. Batson, who serves on the three-person committee, announced his opposition to the proposal in an op-ed piece. He argues that the site is too far away from services downtown, including hospitals and other agencies, and that the city should be looking to build several smaller shelters throughout the city, rather than a 200-bed shelter in one location. According to a memo to the committee, however, a task force studied this suggestion in 2015. The group determined that annual operating costs for a single consolidated shelter would be about $2.9 million, whereas operating costs for five scattered sites would be nearly $4.6 million. City Manager Jon Jennings said he traveled throughout the city to find a suitable location, but the Barron Center Campus emerged as the top choice because it was a city-owned property that met two key criteria – it had access to public transportation and did not hide the issue of homelessness. Batson was among the eight councilors to vote in support of changing the city’s zoning rules to allow shelters in more neighborhoods. However, the Barron Center was not included in the June 2017 action, which focused on allowing shelters in additional business and industrial locations as long as a list of specific conditions were met. The Barron Center is zoned residential. The new zoning rules would require shelters to be located within a quarter-mile of a Metro bus route. That distance could be extended to half a mile if the shelter provides daytime indoor shelter space and develops a plan to help clients use public transit. Other conditions include requiring a management plan that would in part ensure the safety and security of clients and staff as well as address any concerns from neighbors. A shelter must also provide an outdoor area that is screened in, and provide laundry service, showers, a kitchen, pantry and secure storage, among other things.